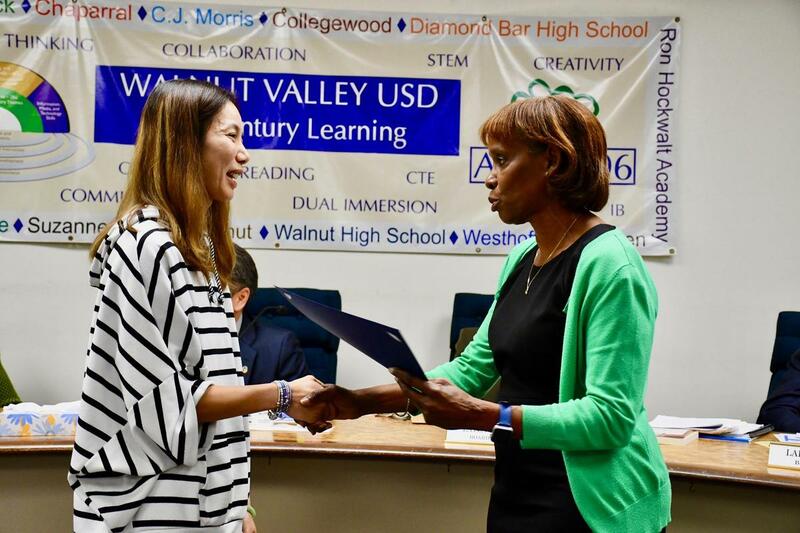 WALNUT, CA--The Walnut Valley Unified School District Board of Trustees paid tribute to star students and community partners during the January 16 meeting. Collegewood Elementary second grader Andrew Huerta was saluted with the school’s Super Star Student Award. Andrew is kind, hard-working, compassionate, and a wonderful helper to classmates. He is described by teachers as being a leader who is always willing to go the extra mile. “Andrew is an exceptional kid and makes Collegewood a better place!” said Principal Dr. Mary Wendland. He is also a creative writer and avid reader who surpassed the suggested summer reading list by reading over 100 books. “Even more impressive is the way that Andrew invited friends to start a summer reading book club,” Wendland said. The children talked about the books and even went on local field trips to museums that tied in with the titles. Volunteer Charles Vance was presented with the Partner in Education Award for demonstrating great character, leadership, and heart. Charles, the husband of retired teacher Elvonne Vance, befriended a student who needed positive relationships and support while helping in her classroom two years ago. 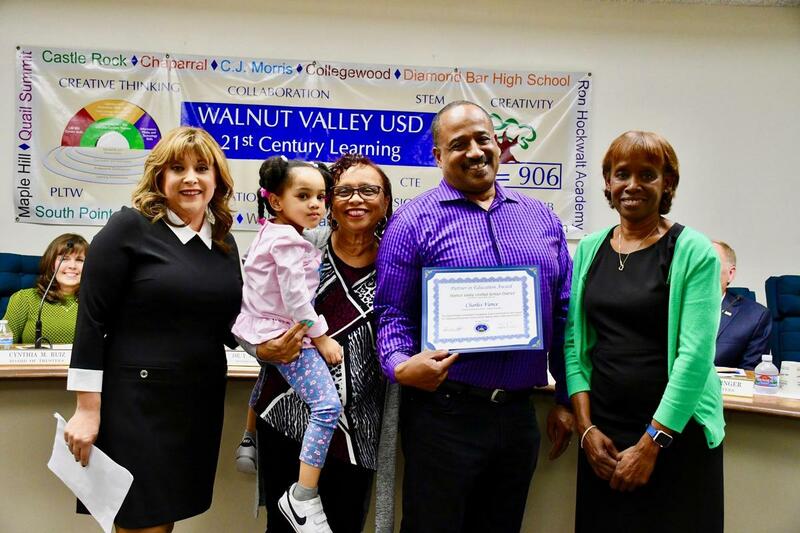 Since then, Charles continued to mentor several Collegewood students by making sure they are doing homework, reading with them, and practicing math facts. He even attends baseball and football games on the weekends. “Mr. Vance is always there for me and helps me with my work so that I don’t get off track,” one student said. 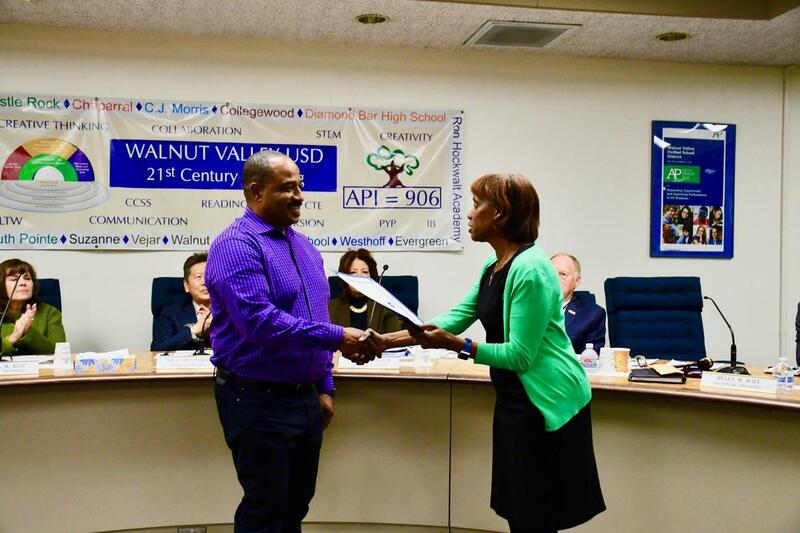 “Charles is a great example to all of us of what a true community hero looks like,” Principal Wendland added. 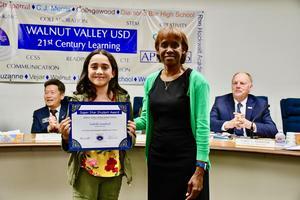 Westhoff Elementary fifth grader Isabella Sandoval received the Super Star Student Award. She is described by teachers as being patient, nurturing, and a natural born problem solver. 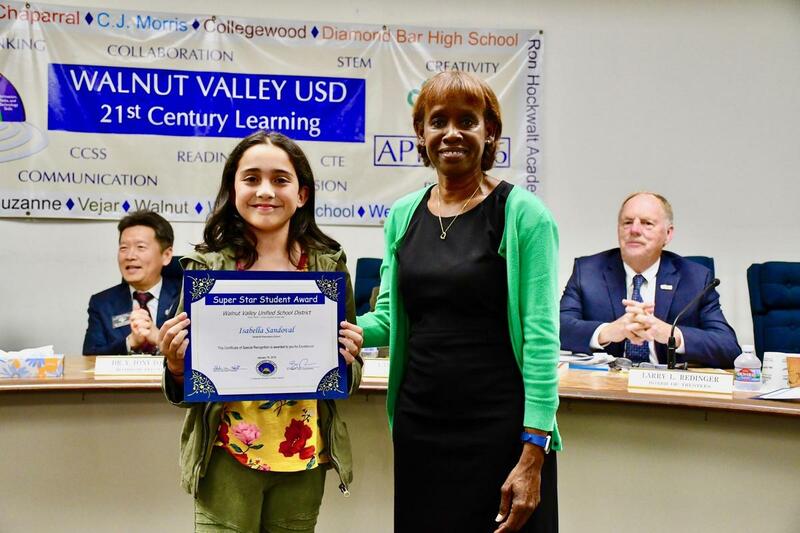 “Not only does she know how to work well with her peers, Isabella brings out the very best in everyone,” said Principal Sandra Lee during the presentation. “Isabella is awesome. She has a wonderful, wise, and calm personality.” one teacher described. 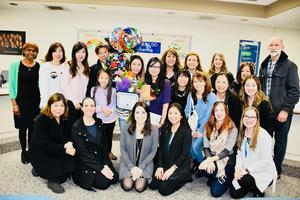 Parent volunteer Kathy Lin was honored with the Westhoff Partner in Education Award. Kathy truly has a heart of gold and has made an incredible impact at our school,” Lee said. 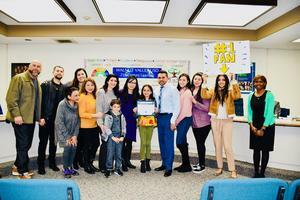 Staff members unanimously voted to honor the super star volunteer with the award. They describe Kathy as being generous, caring, selfless, and having an “all-hands-on-deck” attitude. “She gives her time and heart to Westhoff,” one teacher said. 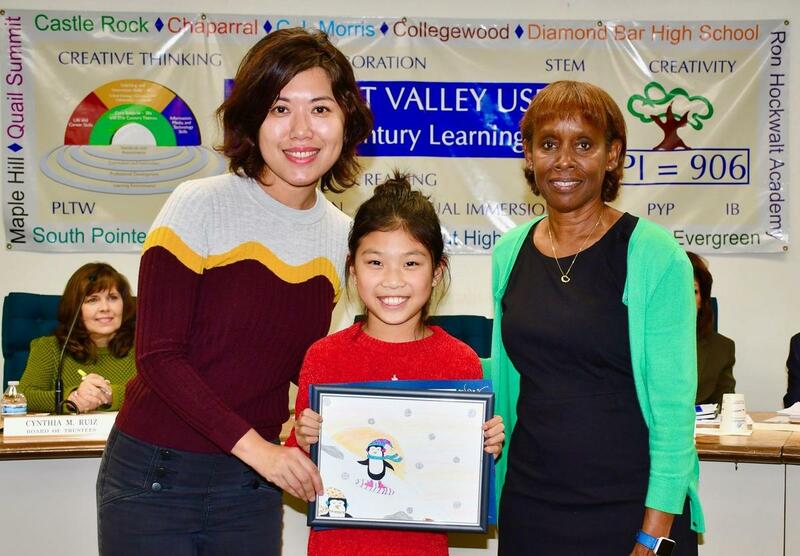 Westhoff Elementary 4thgrader Avery Ma received a certificate of special recognitionas the winner of the 2018 holiday greeting card contest. Avery’s creative submission depicted penguins snowboarding in a winter wonderland scene. 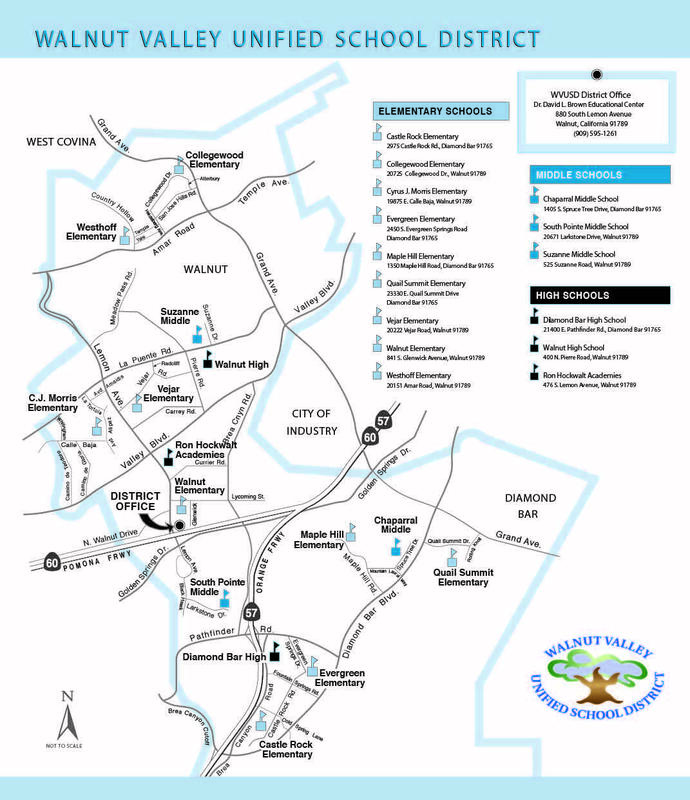 The contest was open to third and fourth grade students throughout the District. Avery received a gift card courtesy of Chili’s in Diamond Bar. 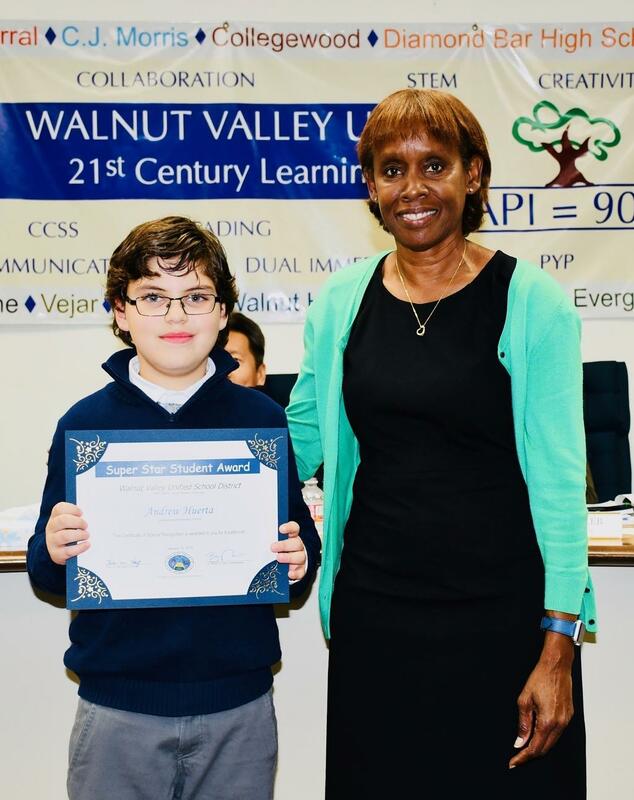 Board President Helen Hall presents Collegewood Elementary 2ndgrader Andrew Huerta with the Super Star Student Award. Also shown with family and staff members. 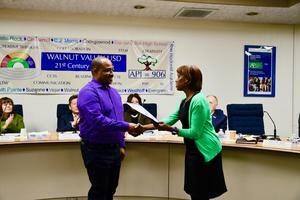 Collegewood Elementary volunteer Charles Vance is honored with Partner in Education Award. Shown with Principal Dr. Mary Wendland, Elvonne Vance, and Board President Helen Hall. 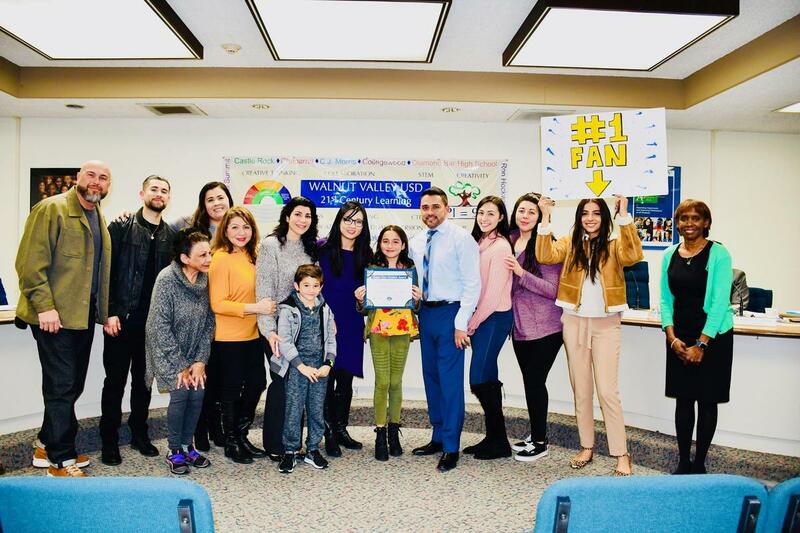 Westhoff Elementary 5thgrader Isabella Sandoval receives the Super Star Student Award. Shown with Board President Helen Hall. Also shown with Principal Sandra Lee, family, and staff members. Westhoff Elementary parent volunteer Kathy Lin receives the Partner in Education Award. Shown with Board President Helen Hall. 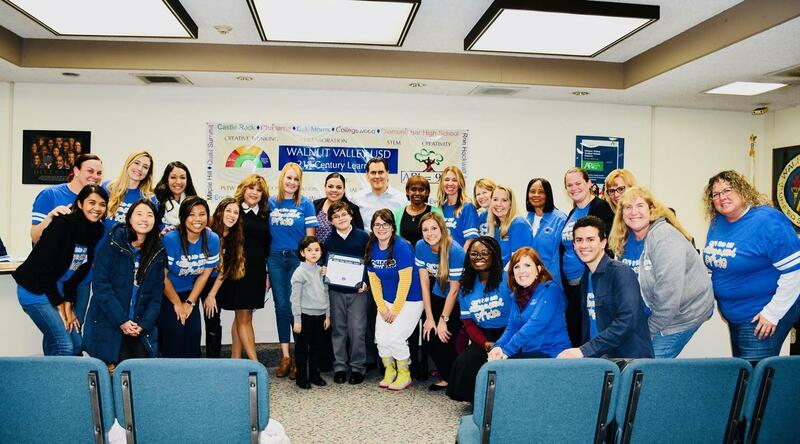 Shown with Principal Sandra Lee, Board President Helen Hall,staff and family members. 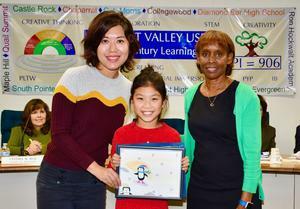 Westhoff Elementary 4thgrader Avery Ma honored as winner of the 2018 holiday greeting card contest on January 16. Shown with Board President Helen Hall.